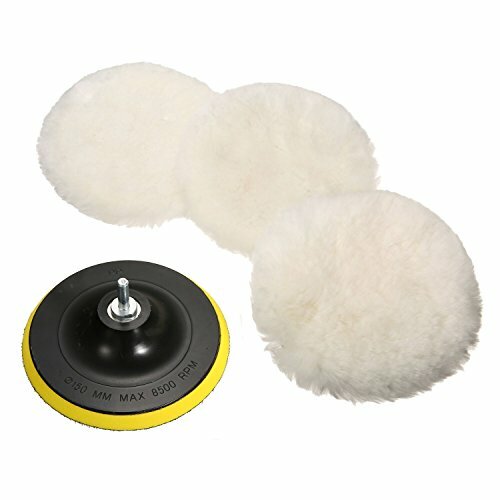 ★DIAMETER: 6inch Polishing Buffer Wool with M14 Drill Adapter.Made of fine lambs wool,polishes surfaces to their glossiest without causing damage. ★EASY TO USE:Can be used in pneumatic or electric polishing machine.Used for Auto car detail polishing.Adhesive backing, you can change pads just in seconds.The back of the disk has velcro, so you can easily change the woolen buffer pad. ★SUITABLE : Can be used on anything that needs Polishing or buffing, like cars, van, glass, stone, ceramic etc. There are 3 Polishing Buffer Wool to choose from and easy to change and reusable . ★PACKAGE INCLUDES:6inch Polishing woolen buffer with 3 pack,1 adhesive backer pad,1 M14 drill.Cleaning products with 15-25 degrees water.